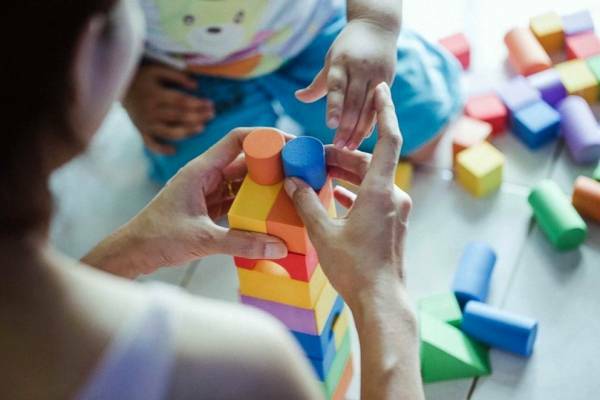 The American Academy of Pediatrics recently released an updated clinical report with recommendations on the best toys for children's development -- toys that promote play between a caregiver and child. The report focuses on toys for children from birth through school age. As "interactive" electronic toys increasingly fill stores and children's rooms, the AAP warns families against using them as a replacement to traditional hands-on toys and games, which aid in healthy development. "Toys have evolved over the years, and advertisements may leave parents with the impression that toys with a 'virtual' or digital-based platform are more educational. Research tells us that the best toys need not be flashy or expensive or come with an app. Simple, in this case, really is better. Toys are key to developing children's brains, problem-solving, social interactions, language and physical activity. One of the most important reasons for kids to play with toys, especially in their infancy, is to facilitate warm, supportive interactions. The most ideal toys are those that match the child's developmental abilities while encouraging the development of new skills. Caregivers should choose toys that allow children to use their imaginations — ones that aren't overstimulating. The best toys are those that support parents and children playing, pretending and interacting together. When children play with parents -- the real magic happens, whether they are pretending with toy characters or building blocks or puzzles together. Many of the new "interactive" entertainment choices, including videos, computer programs and tablet apps, make claims about educational benefits in their advertisements. But according to the American Academy of Pediatrics (AAP), these are unsubstantiated. If caregivers choose to give children "interactive" media, it should work for them within their family values. When used inappropriately or without thought, these media can displace important activities like family time, interactions with friends, outdoor play and exercise. • Children younger than 5 should play with computer or video games only if they are developmentally appropriate, and they should be accompanied by the parent or caregiver. Toy characters and objects: Such as dolls, action figures and stuffed animals, and toy food, cars and planes. These toys allow for pretend and imaginary play, which is a big part of a child's social and emotional development. Blocks, shapes, puzzles and trains: These help children learn problem-solving skills, develop fine motor skills and can improve language and brain development. Card games, board games, books and toy letters: They create ways for you and your child to interact and help develop language skills. Digital toys, such as a toy bear that reads a story aloud or a board game on an app with virtual players, should never take the place of real face-to-face play. Push-and-pull toys, balls and tricycles: These incorporate physical play, which helps motor and physical development. When played with other children, these toys can also improve self-regulation and peer interaction through negotiations around the rules of the game. Coloring books or pads of paper: Using crayons, markers, stickers, etc. helps children build creativity and improve fine motor skills. The best toys for your child are ones that match your child's developmental skills and abilities, and encourage the development of new skills. Age-appropriate toys: Check the package for the recommended age range for any toy and remember that toys above a child's maturity may be a safety hazard because of small parts that they could choke on. Safety first: Check for loose parts on toys and keep all toys clean. Remember that long strings and ribbons pose safety problems. Consider durability: Is the toy washable, well-constructed, durable and safe? Think senses and manipulation: Toys that are colorful and have different textures, like toy musical instruments, textured puzzles and mobiles, will get a child's attention and stimulate senses. Toys that can be manipulated, such as shape sorters and stacking blocks, are great for fine motor, cognitive and perceptual skills. You can find more toy selection tips on HealthyChildren.org, the AAP website for parents.